Shadow Complex 2 Has Been Designed. Can We Just Play It Already? Man, I still don't quite know what it was about Shadow Complex. I loved that game so much. So when Cliff Bleszinski told me that its sequel has already been designed, it just about made my day. Shadow Complex came out of nowhere for me—it was 2009, and I was totally wrapped up in Batman: Arkham Asylum. But I found that I was playing both games at the same time, and they combined to form this incredibly potent cocktail of exploration, combat, and Metroidvainia-ish map tourism. Where Arkham Asylum was a complex 3D adventure, Shadow Complex was a nice, more low-key 2D side dish. Two years later, and we're on the eve of the release of Arkham Asylum's sequel, Arkham City. And as much as I'm looking forward to that game, it won't be the same without a new Shadow Complex to accompany it. It'll be like having a delicious steak dinner without a fine red wine to wash it down. Chair, the Epic Games-owned development studio behind Shadow Complex, is currently quite busy with their breakout iOS hit Infinity Blade. Last week, I spoke with Epic's Design Director Cliff Bleszinski about Gears of War 3, and at the end of our chat, the conversation turned to Chair. I asked what had become of Shadow Complex. 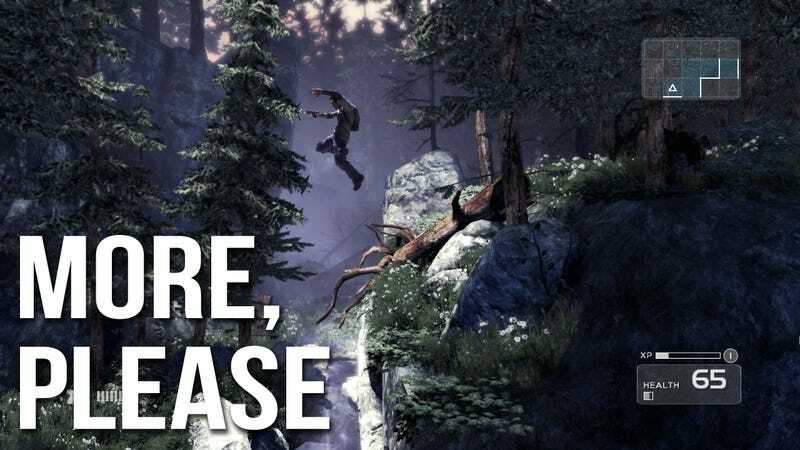 "Shadow Complex 2 has been designed," Bleszinski said, "it just hasn't been match-lit and finished." This makes me both really happy and really sad—happy, because the game exists (and "has been designed!") but sad that the success of Infinity Blade means that we probably won't get to play it anytime soon. As Bleszinski put it, "The projects we do align with where we need to be as a studio, strategically. We knew we needed to be on iOS." In other words, it makes more sense for Epic to have Chair focus on making successful iOS games than to make an XBLA-exclusive downlodable game like Shadow Complex 2 (though it certainly sounded as though Shadow Complex 2 will still be released sometime). As much as I enjoy Infinity Blade (and I do enjoy it), it can't compare with Shadow Complex. Everything about Shadow Complex just clicks for me—the sound effects, the look and feel, the throwaway Airport-paperback story, the funky cutscenes, the slow-mo fadeout that happens when I get a new item. Argh, just writing this makes me want to go play it. The closest thing that's been released recently was this year's arty Summer of Arcade game Insanely Twisted Shadow Planet. But while I liked that game fine, some combination of its loneliness and floatiness didn't hit me in quite the same way as Chair's on-foot game did. While we may not get to play Shadow Complex 2 anytime soon, we can at least rest secure in the knowledge that somewhere out there are design documents for a bigger, better, and no-doubt even more compulsively Metroid-tastic sequel. Okay, gonna go try to get that speedrun achievement now.